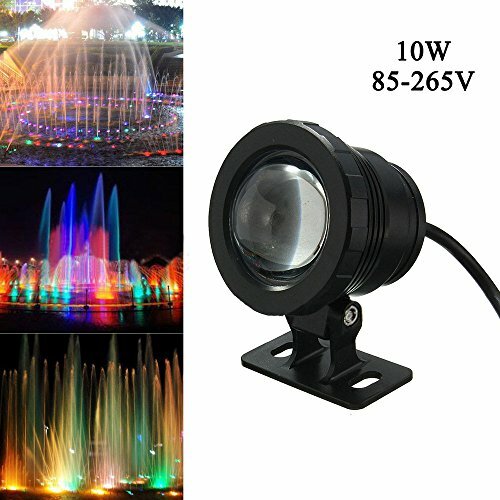 Cacys Store 10W Waterproof RGB Led Underwater Light AC85-265V Fountain Swimming Pool Landscape Lamp W/Controller (Black) | Fountain City Art Ctr. ✔100% brand new and high quality. ✔Comes with LED bulb, 180 degree direction. ✔Super bright and long-lasting. Easy to install. ✔Ideal for aquarium, fountain or pond, illuminates and colors the aquarium,enliven the garden pond to get ideal atmosphere and beauty. If you have any questions about this product by Cacys Store, contact us by completing and submitting the form below. If you are looking for a specif part number, please include it with your message.